So last week I finally took the plunge and linked up with Sarah over at Accepting and Embracing Autism and dived head first into making some goals. Not wanting to overwhelm myself I kept it all pretty simple. Sounded pretty easy really. Only reality was not as easy. I did manage to get my five posts done. Actually I managed 6 so that is not a bad effort at all. One of them was even a non link up post! Yep that's right somehow I managed to write a post totally unrelated to anything at all. (It is here if you are interested) So far so good but here is about where it ends. I did not even come close to exercising for 30 minutes three times last week. I took the kids for a swim yesterday afternoon and that is it. I don't think I even stopped to think about fobbing off exercising. Pure and simple exercising was not even close to my radar last week. The way I see it I have a couple of options. I could easily just give up and forget about making goals. Only we all know how important goal setting can be. I have been harping on about goals since almost time began. Well at least since this blog began. After much thought I have decided that this week I will take a new approach. No more of this taking it easy and giving myself a somewhat free ride. 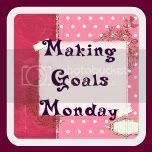 This week I am going to give myself a lovely long list of goals in the hope that the levels of achievement might also increase. Hope you get good time on Monday!